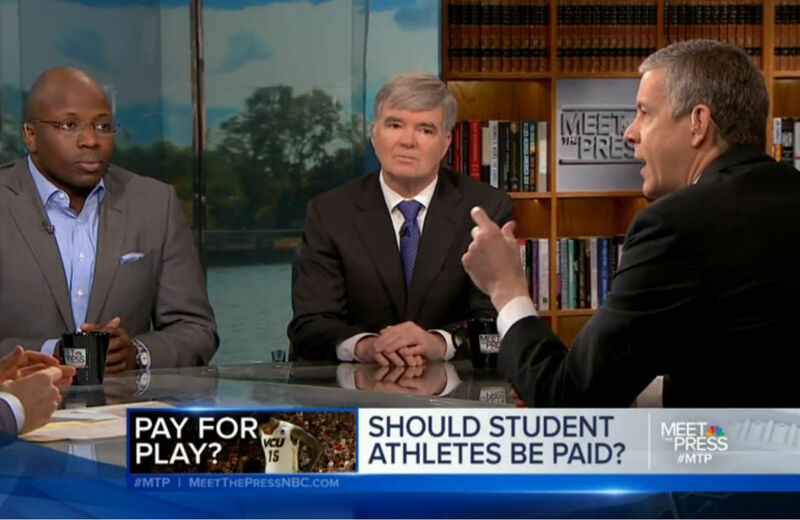 Bringing Arne Duncan and NCAA President Mark Emmert together to discuss the question of compensating college athletes produced predictable results. To discuss this issue, Gregory secured three people for the Meet the Press table, including NCAA President Mark Emmert. That's good start! Mark Emmert, is a man who makes a $2 million annual salary defending the status quo. The people Emmert could have been in discussion with is tantalizing. Maybe we would see civil rights author Taylor Branch, whose piece on the NCAA rocked the sports world. Perhaps one of the other guests would be New York Times columnist William Rhoden, whose book $40 Million Slaves examined the social position of African-American athletes. Or we could get USA Today’s Christine Brennan, who has written extensively about equity for women in college athletics. Or it could have been when Duncan called for “middle ground” between Emmert and those calling for athletic compensation. This middle ground for Duncan? “Making sure students are fed, making sure if there's an emergency at home and mom gets very sick or dad passes away, they have an ability to get home to attend the funeral.” It’s the Arne Duncan "Food n' Funerals Plan” to fix the NCAA. Yet far more glaring than the content of the discussion was what the discussion was missing. This is not surprising given the parties sitting around the table, but there was zero discussion about how institutionalized racism animates the amassed wealth of the NCAA, the top college coaches and the power conferences. It does not take Cornel West to point out that the revenue producing sports of basketball and football are overwhelmingly populated by African-American athletes. The population of the United States that is most desperate for an escape out of poverty is the population that has gotten the rawest possible deal from an NCAA, which is actively benefiting from this state of affairs. That is why Dr. Harry Edwards called the issue of compensating NCAA athletes "the civil rights movement in sports of our time." That is why Bill Maher uncorked the most viral tweet of his life when he wrote over the weekend, "March Madness is a stirring reminder of what America was founded on: making tons of money off the labor of unpaid black people." The issue of the NCAA is a racial justice issue. If you don't frame it in that way, if you don’t challenge Mark Emmert on the fact that faux-amateurism saps black wealth in the United States, if you don’t point out why Taylor Branch, Dr. King’s biographer, said the NCAA “has the whiff of the plantation,” then you are not having a serious discussion. You are bullshitting. Meet the Press did not give us a serious discussion. Instead you had Mark Emmert, a man on the hot-seat, sitting far too comfortably for our own good.